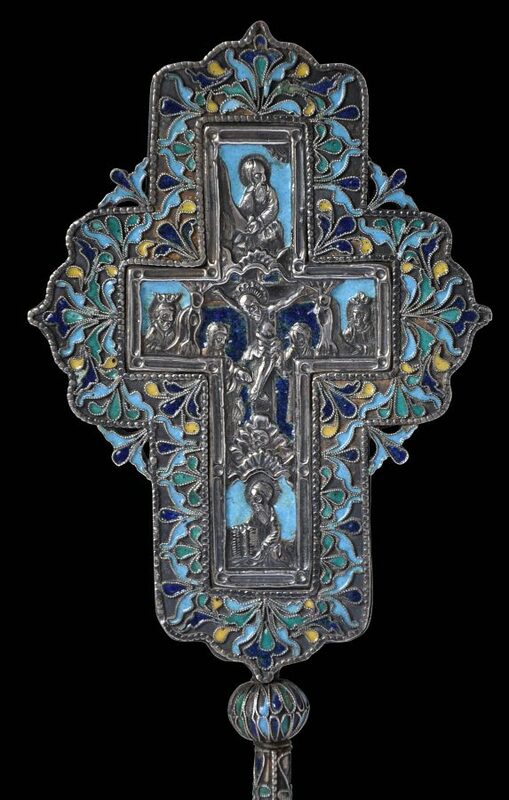 This cross is of silver, pearled silver wire filigree, and blue, turquoise, green and yellow champleve enamel. It would have adorned a holy altar table in a wealthy Armenian home. 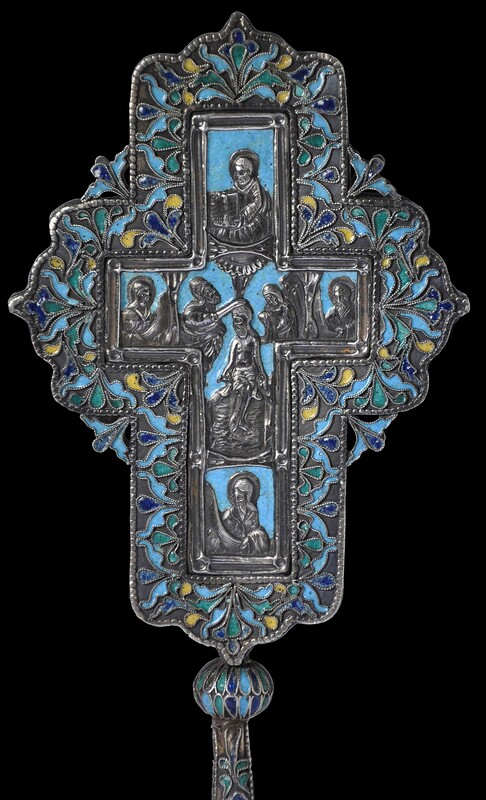 It belongs to a rare group of enamelled silver items produced for an Orthodox Armenian altar. The Kalfayan Collection of Armenian Art includes a tabernacle, and three incense containers that appear to have come from the same workshop, if not the same hand, as this altar cross. 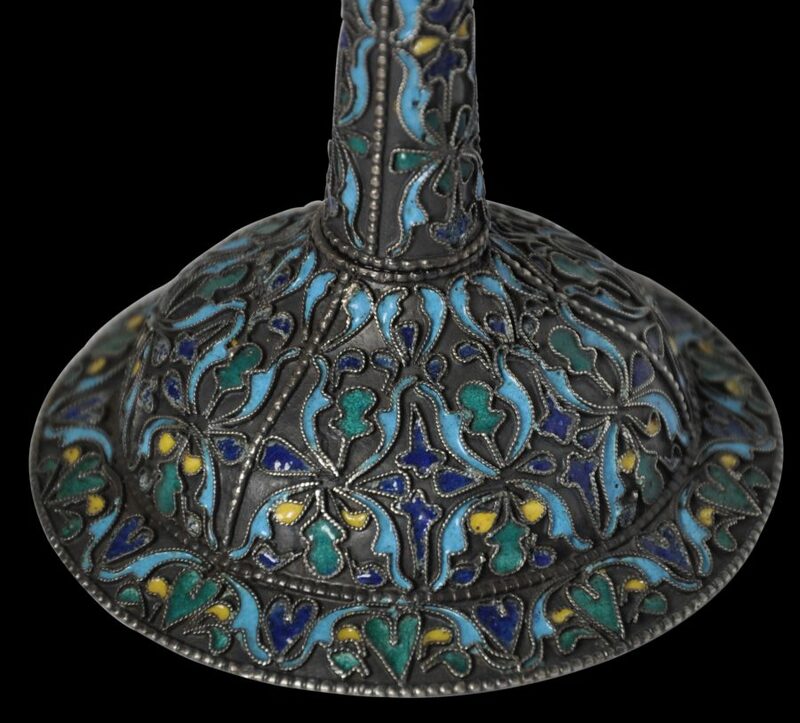 Extant examples of Armenian enamelled silverwork are rare; it is believed that most such examples have been melted down. The cross is decorated all over with enamel. 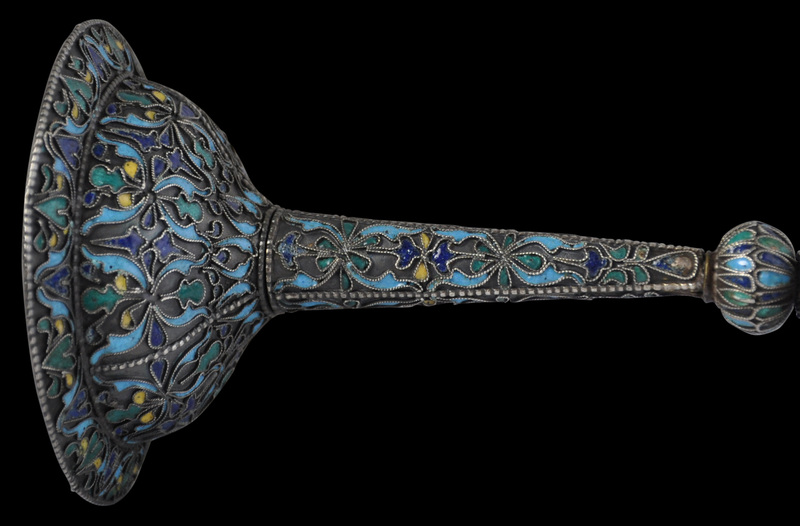 It sits on a domed, circular foot, has a thin, narrowing stem that rises to an enamelled silver ball fitting, and then a large cruciform top which comprises two silver sheets repoussed and enamelled and linked together by a band of silver filigree work. One side of the cross is decorated with Christ on the Cross. Two mourners (probably Mary and another) stand beneath and two kings or saints are on either side. A skull is at the base of the Cross. This indicates that the Cross has been set on Golgotha, the place of the skull of Adam, as mentioned in the Gospels. A figure holding a book is in the lower register and another holding a scroll is in the upper register. Possibly, these are the Apostles Thaddeus and Batholomew who are credited with having taught the Gospel to the Armenians. The other side shows Christ being baptised by the Baptist. Three others are present including a female figure who brandishes a towel. The possible Thaddeus and Batholomew figures are present too but in reverse positions. 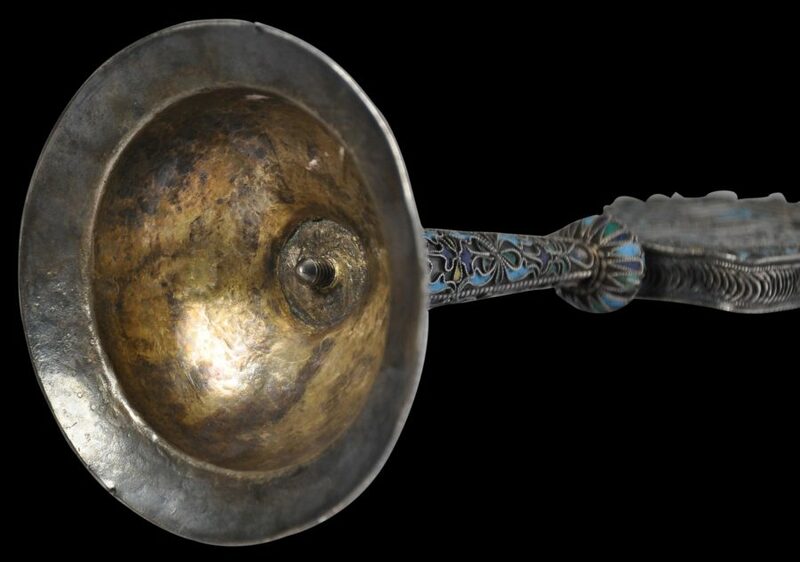 Click here to see an Armenian enamelled silver cup and saucer that sold at Christie’s London ‘Art of the Islamic & Indian Worlds’ sale, April 21, 2016. The altar cross here is in excellent condition; enamel losses are minor, and there are no repairs. Bagnoli, M., et al, (eds. ), Treasures of Heaven: Saints, Relics and Devotion in Medieval Europe, The British Museum Press, 2010. Hassiotis, I.K., et al., Aspects of Armenian Art: The Kalfayan Collection, Museum of Byzantine Culture, 2010.